Zebrafish are an excellent animal model to study human cancer because they share many genes in common with humans and are transparent, allowing us to track the behavior of tumors cells as they move throughout the animal. This image shows melanoma cells that were placed into a defined space in the embryonic brain to allow tumor cell invasion to the skin to be analyzed directly. 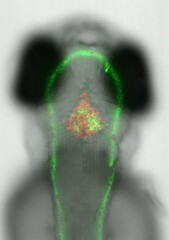 Control tumors (red) are mixed with experimental tumors (green) that express genes that promote tumor invasion.